Tom VandeWater stands at the railing of the Coolwater Fire Lookout in the Nez Perce-Clearwater National Forests near Lowell, Idaho, on July 18. VandeWater, from Canton, N.Y., has staffed the lookout each summer for many years for the U.S. Forest Service. 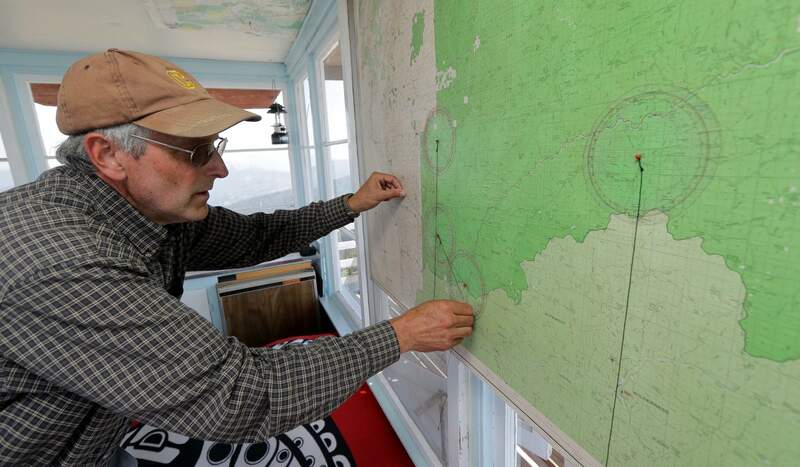 Tom VandeWater explains how he uses a device called the Osborne Fire-Finder to pinpoint the location of any smoke or fires he spots from the U.S. Forest Service Coolwater Fire Lookout in the Nez Perce-Clearwater National Forests near Lowell, Idaho. Tom VandeWater stands at the railing of the Coolwater Fire Lookout in the Nez Perce-Clearwater National Forests near Lowell, Idaho, on July 18. 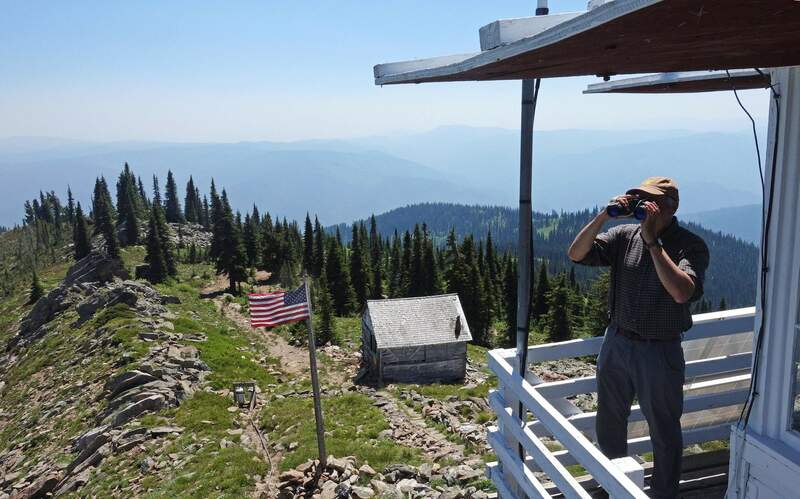 VandeWater has staffed the lookout each summer for many years for the U.S. Forest Service. At left is the previous lookout structure, which dates to the 1930s. Tom VandeWater stands at the railing of the Coolwater Fire Lookout in the Nez Perce-Clearwater National Forests near Lowell, Idaho, on July 18. Tom VandeWater demonstrates how he uses a device called the Osborne Fire-Finder to pinpoint the location of any smoke or fires he spots from the Coolwater Fire Lookout in the Nez Perce-Clearwater National Forests near Lowell, Idaho, on July 18. 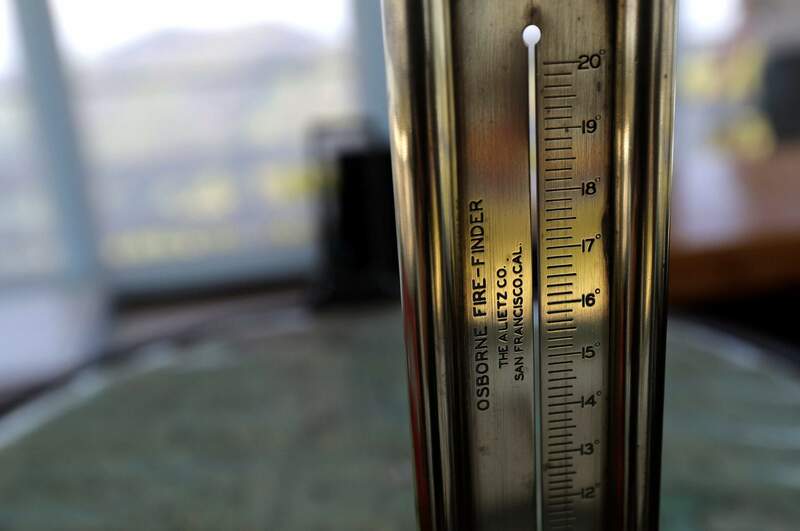 The rear sight of a device called the Osborne Fire-Finder that is used to pinpoint the location of smoke or fires spotted from the Coolwater Fire Lookout is shown at the lookout in the Nez Perce-Clearwater National Forests near Lowell, Idaho, on July 18. 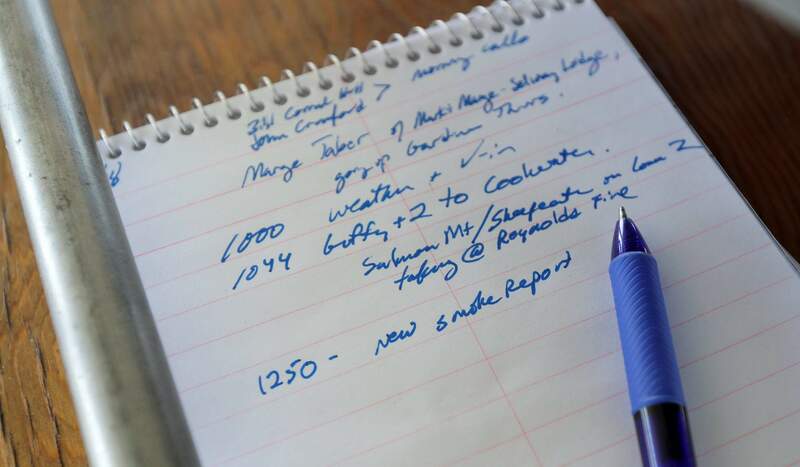 Notes made by U.S. Forest Service fire lookout Tom VandeWater are shown on a pad at the Coolwater Fire Lookout in the Nez Perce-Clearwater National Forests near Lowell, Idaho, on July 18. Fire-lookout towers, perched atop remote, craggy peaks across the U.S. West, may seem like quaint reminders of an era before satellites, smartphones and jet-propelled air tankers, but the structures and the people who staff them play a crucial role in the nation’s front-line efforts to stop wildfires. The Coolwater Fire Lookout, upper left, sits high on a peak in the Nez Perce-Clearwater National Forests near Lowell, Idaho, on July 18. The lookout has been staffed each summer for more than 100 years. 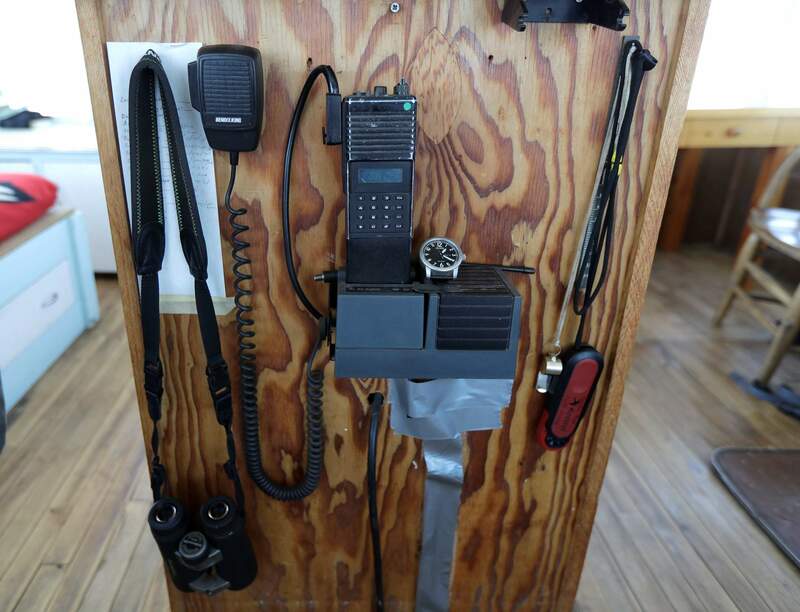 A radio, binoculars and other tools used by Tom VandeWater, who staffs the Coolwater Fire Lookout each summer for the U.S. Forest Service, are displayed in the Nez Perce-Clearwater National Forests near Lowell, Idaho, on July 18. Tom VandeWater, left, explains how he uses a device called the Osborne Fire-Finder to pinpoint the location of any smoke or fires he spots from the Coolwater Fire Lookout to Cory Guffey, a U.S. Forest Service initial attack crew captain, at the Coolwater Fire Lookout in the Nez Perce-Clearwater National Forests near Lowell, Idaho, on July 18. 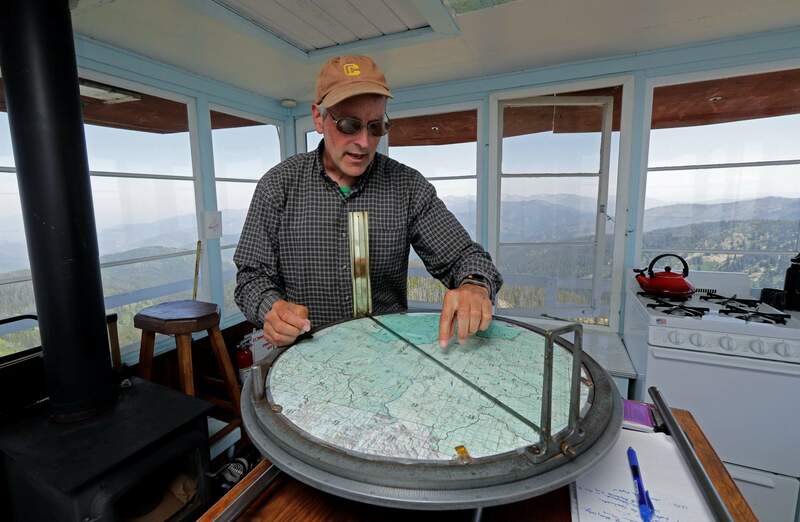 Tom VandeWater, who staffs the Coolwater Fire Lookout in the Nez Perce-Clearwater National Forests for the U.S. Forest Service near Lowell, Idaho, demonstrates how he uses the location and sight-lines of other fire lookouts to help pinpoint the location of any fires or smoke he spots from his lookout station on July 18. 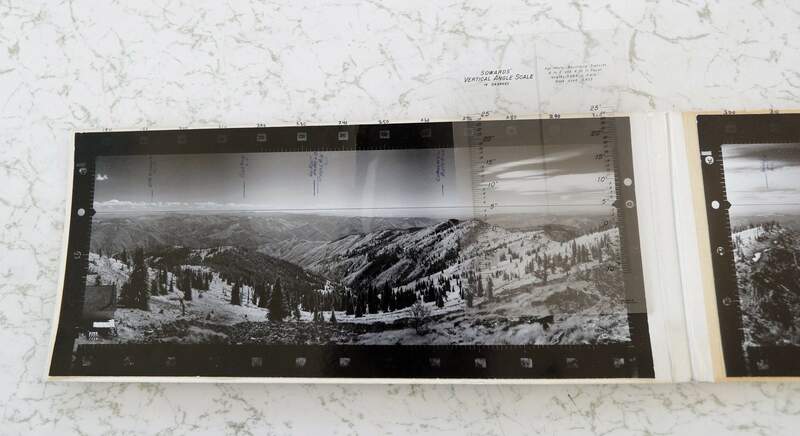 A panoramic photo likely dating from the 1950s is shown at the Coolwater Fire Lookout in the Nez Perce-Clearwater National Forests near Lowell, Idaho, on July 18. Tom VandeWater, who staffs the station each summer for the U.S. Forest Service, uses the photos, which are precisely marked with directional measurements, to help him identify the names and areas of possible fire locations when he spots fires at night. 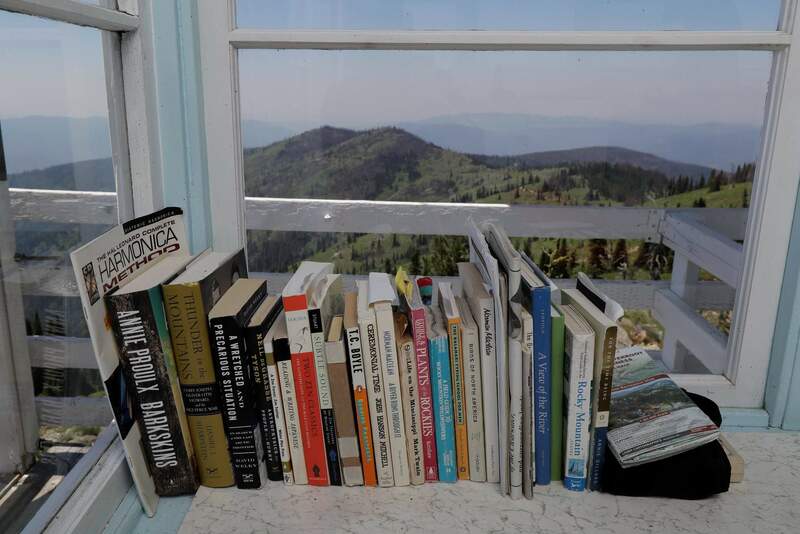 Books and other reading material are shown on a table at the Coolwater Fire Lookout in the Nez Perce-Clearwater National Forests near Lowell, Idaho, on July 18. 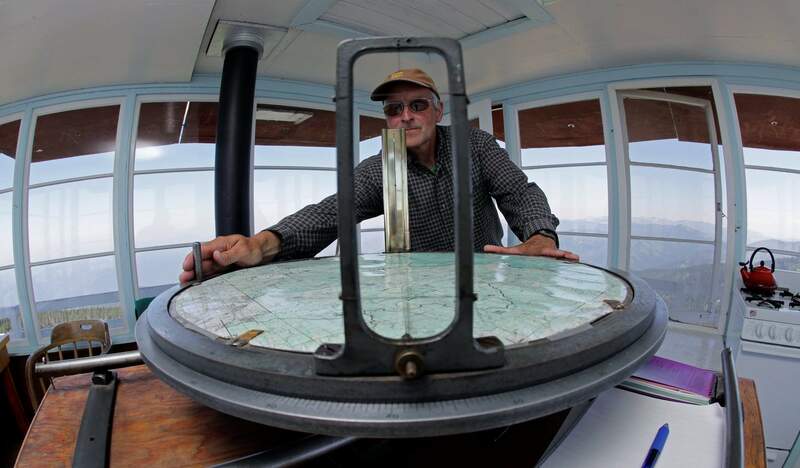 Tom VandeWater has staffed the lookout each summer for many years for the U.S. Forest Service. 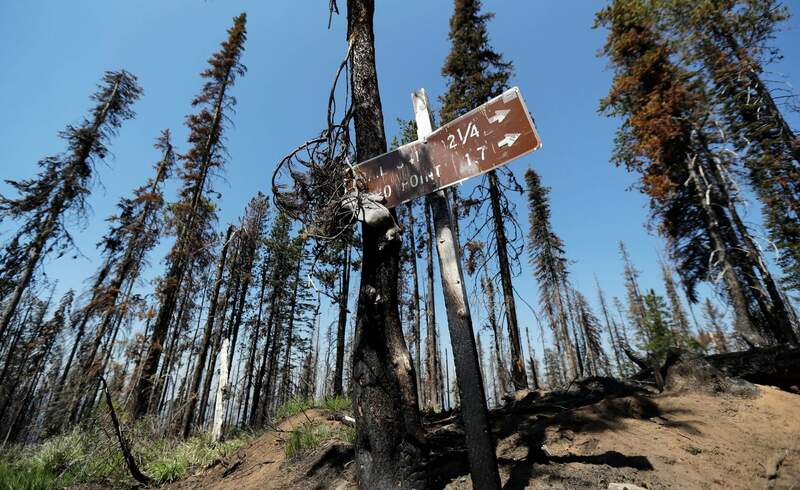 A trail sign and trees that were burned in a 2017 wildfire stand out from the blue sky a few miles from the Coolwater Fire Lookout in the Nez Perce-Clearwater National Forests near Lowell, Idaho, on July 18. Tom VandeWater walks up the stone steps to the Coolwater Fire Lookout in the Nez Perce-Clearwater National Forests near Lowell, Idaho, on July 18. VandeWater, from Canton, N.Y., has staffed the lookout each summer for many years for the U.S. Forest Service. 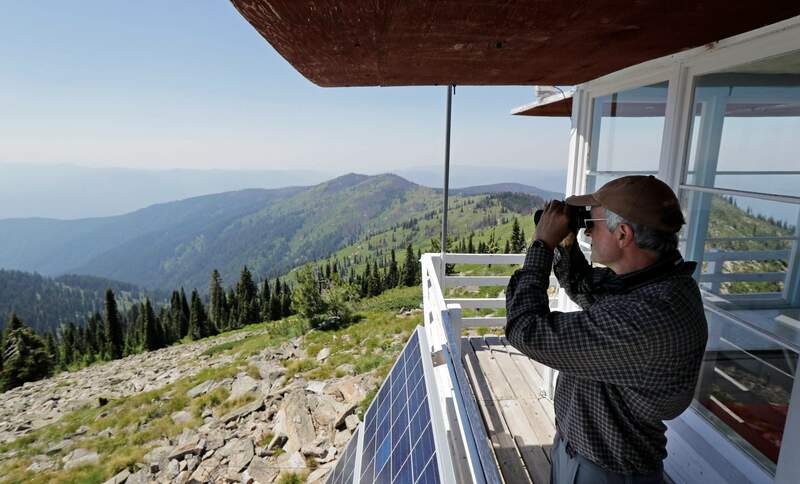 BOISE, Idaho – Fire-lookout towers perched atop remote, craggy peaks across the U.S. West may seem like quaint reminders of an era before satellites, smartphones and jet-propelled air tankers. Indeed, some of the structures are more than 100 years old. But with their lofty views and good old-fashioned human observation, fire lookouts play a crucial role in the nation’s front-line efforts to stop wildfires. Fire lookouts start taking on more responsibility now as wildfire season transitions from lower elevation grasslands to higher elevation forests. Some towers are just getting staffed as snow melts and they become accessible. Last week, according to the National Interagency Fire Center, there were more than 50 large wildfires, mostly in the West, that have consumed about 1,500 square miles. The Forest Service saw the need for early detection following wildfires in 1910 in Idaho and adjacent states that merged, killing 87 people and torching 4,700 square miles. The solution was fire lookouts, with the number peaking somewhere around 5,000 in the 1940s, many constructed by the Civilian Conservation Corps, a federal program that paid young, unemployed men during the Great Depression to plant trees, develop parks and build roads and other structures. Only about 400 lookouts remain, mostly in the West, after the Forest Service decided aircraft could replace them and destroyed many lookouts from the 1960s through 1980s rather than pay for needed repairs. Using aircraft to spot wildfires, particularly after lightning storms, has become a significant part of the Forest Service’s firefighting efforts. But officials have also found the remaining lookouts spot the majority of forest wildfires in the areas they cover, giving firefighters crucial extra time to put out wildfires before they spread. In general, officials say, aircraft can remain aloft for only limited periods and can miss the faint or intermittent smoke from a nascent wildfire. A fire lookout can zero in on the area and spend more time observing it to get a better understanding of what might be happening. 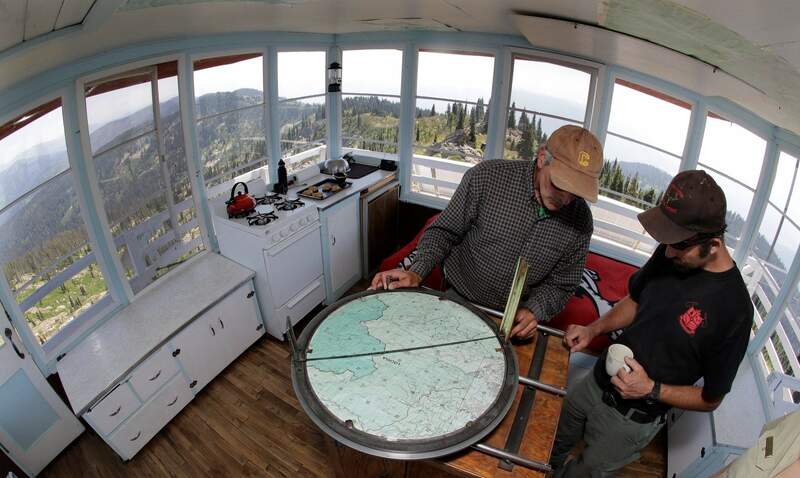 Fire-lookout towers are found mostly in national forests, which have autonomy on using them. Idaho’s Salmon-Challis National Forest in 2010 opted to boost its staffed lookouts from four to six and cut back on flights over the rugged area. Those who staff the lookouts usually live in the rustic, one-room towers or in nearby cabins during fire season. Each tower is unique, but many are outfitted with a bed, a table and chairs and an outhouse. Some contain small kitchens and wood stoves. Lookouts make about $14 an hour for an eight-hour day and time-and-a-half for overtime. 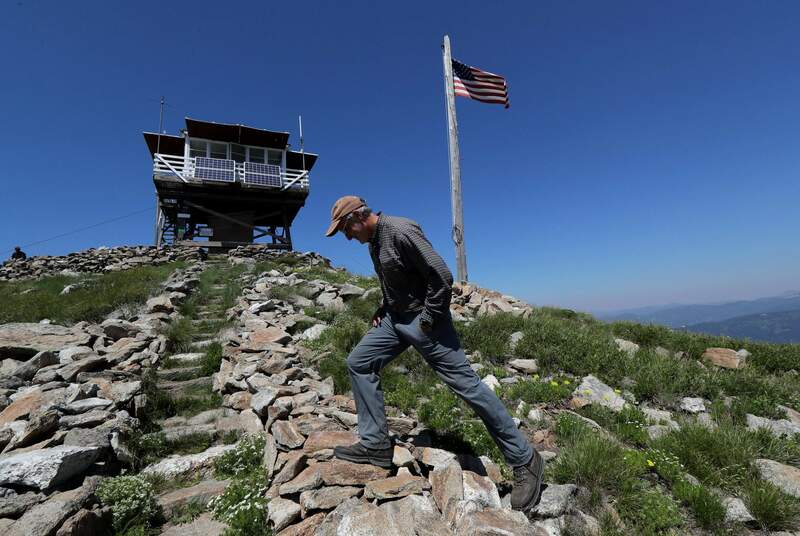 In an average four- to five-month season, Eustace said, a busy fire lookout can expect to work 200 to 300 hours of overtime. 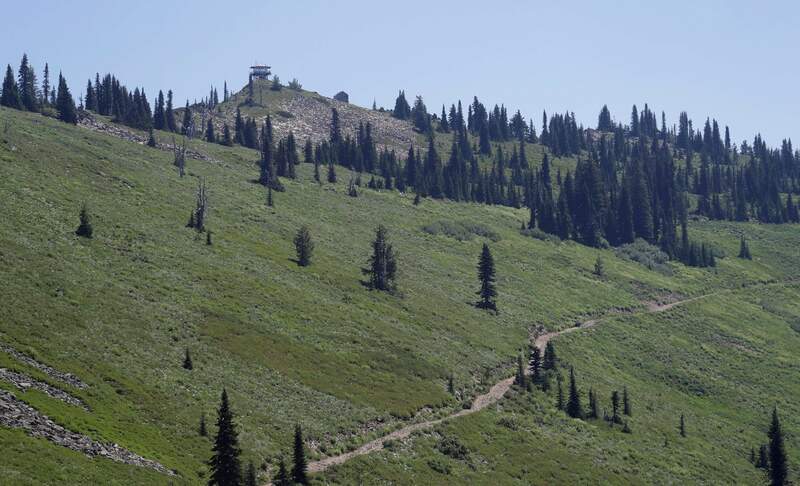 The walk into Patrol Mountain Lookout is not so easy either – a 6-mile uphill hike, a typical effort for many fire lookouts. That’s a selling point, the Forest Service discovered, for backcountry enthusiasts who don’t mind spending money to hike in and rent a fire lookout that’s no longer active and experience what Duffy gets paid to do. Medicine Point Lookout in the Bitterroot National Forest is where Eustace started his firefighting career in 1976. “It was essentially saved from destruction because the Forest Service decided to restore it and put it into the rental program,” he said. Nearly 75 such lookouts are available for rent, the sales pitch combining great views with a sense of history. Medicine Point was built in 1940 and, like many other lookouts, is listed on the National Register of Historic Places. 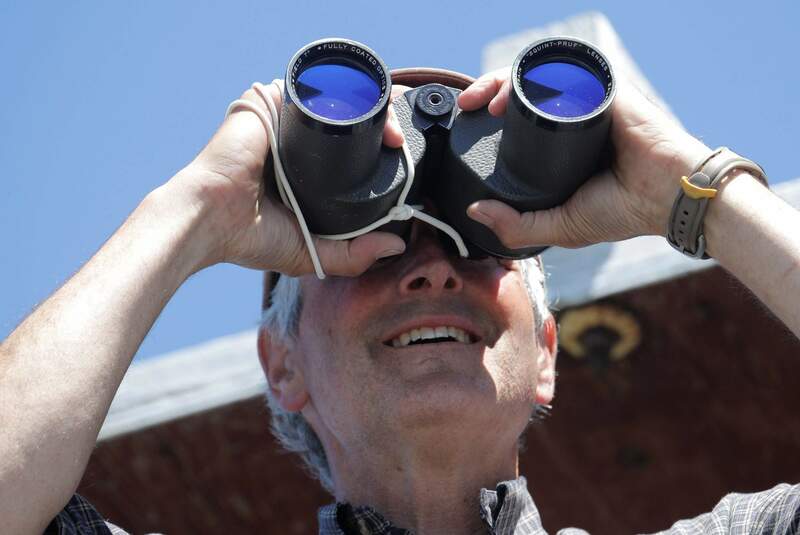 Efforts continue, meanwhile, to figure out a way to once and for all make fire lookouts obsolete with modern and potentially cheaper ways to spot fires. One plan replaces humans with remotely operated cameras.